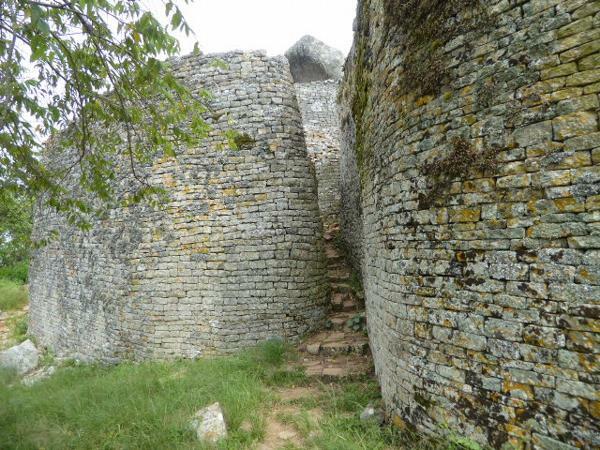 Great Zimbabwe landed on UNESCO's World Heritage list in 1986, a half-dozen years after the end of white rule. There were plans back then for trams ferrying boatloads of visitors around the site. Never happened. 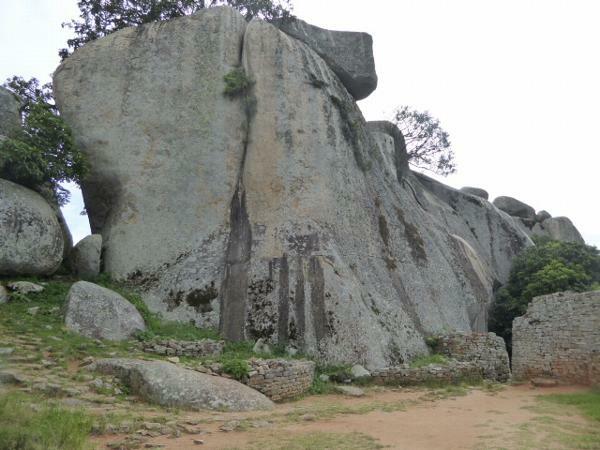 Good thing: a UNESCO archaeologist called the proposal "an extremely expensive way of spoiling one of Zimbabwe's most beautiful assets." Conclusion? There's an upside to ruined states: you can have spectacular sites almost to yourself. 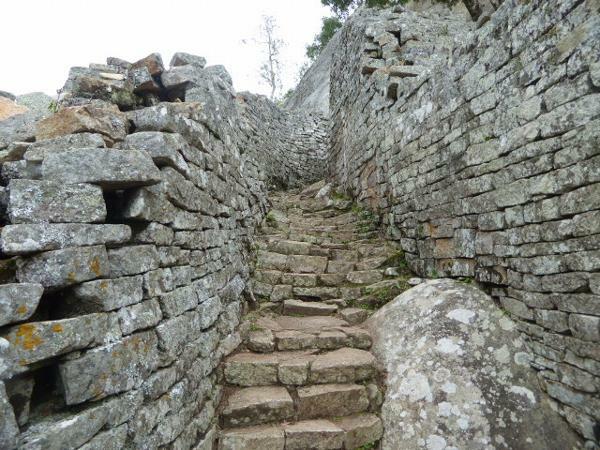 See Joost Fontein, The Silence of Great Zimbabwe, p. 174. Small world: the advisor was Hamo Sassoon, a brother of Siegfried. . There are two primary features at the site. 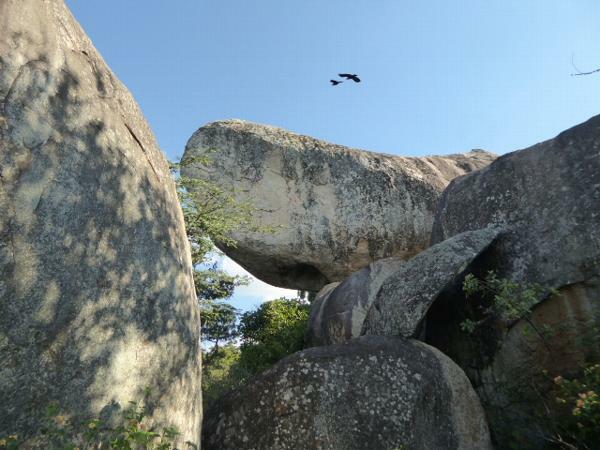 One is this granite dome. See anything unnatural about it? Uh, don't mind the beautiful meadow: it's left over from a golf course built in the days of Southern Rhodesia. Abandoned during the civil war that accompanied the transition to black rule, it was blessedly never restored. Here's a preview of what's up top. 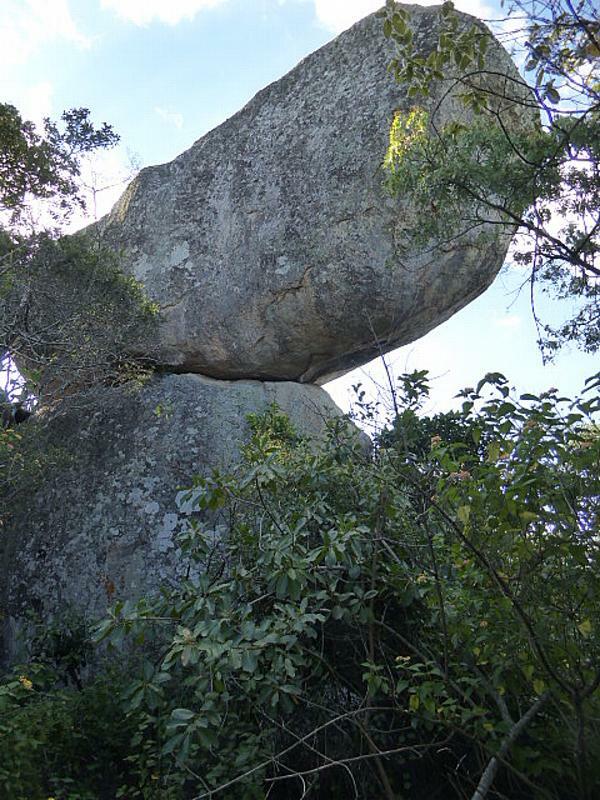 The mountain naturally sheds parallel-sided slabs of granite. Presumably they were the inspiration for someone to stack the blocks into walls. 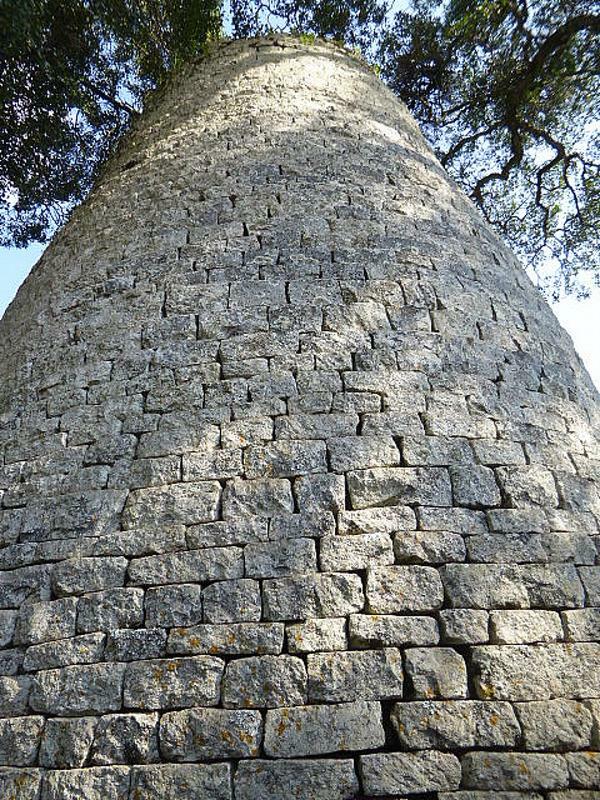 Generally twice as high as they are thick, the walls of Great Zimbabwe are not made entirely of blocks, however. Instead, they are filled with rubble and only faced with blocks. 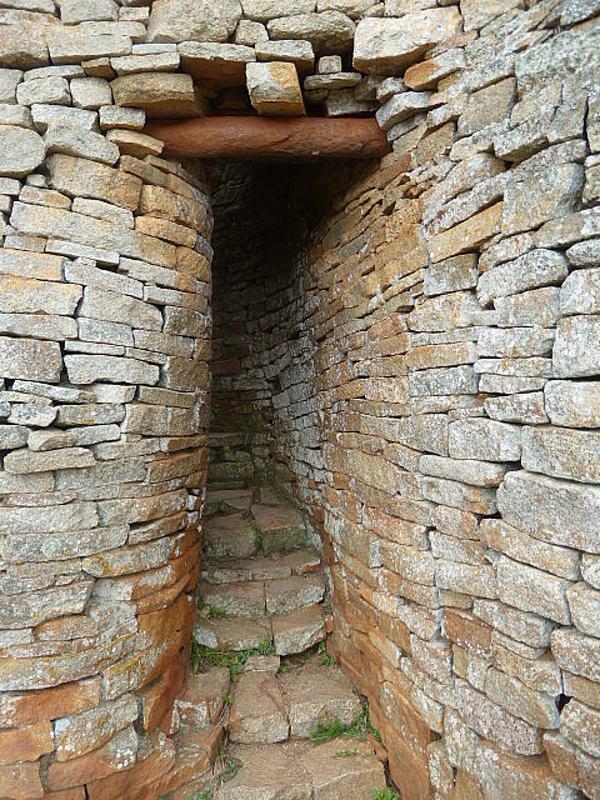 Still, they're handsome, and the builders used only two kinds of simple tools: first, stone hammers to knap the corners and, second, measuring rods to keep the courses horizontal. 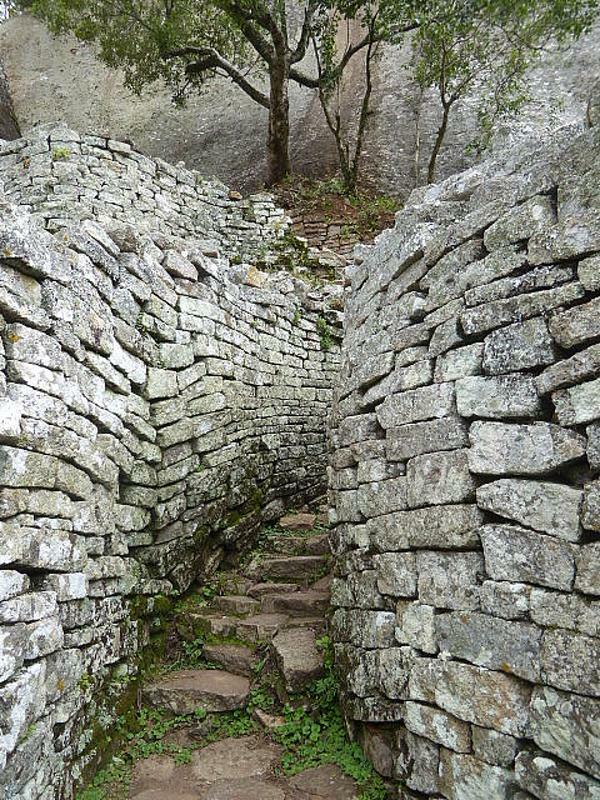 How do you break stone with stone? Answer: find a stone harder than the one you want to break. In this case, the hammers were dolerite (diabase), a dark rock harder than granite. And here's the other primary feature. It sits on a gentle slope a few hundred yards from the mountain. It's had various names over the years, including the Temple, the Woman's Great House, the Elliptical Building, and the Great Enclosure. This is the iconic feature within the enclosure. It's a tower replicated around Zimbabwe today on everything from gas stations to funeral homes. What it is or was is another matter, but it's hard to top the speculations of early visitors. 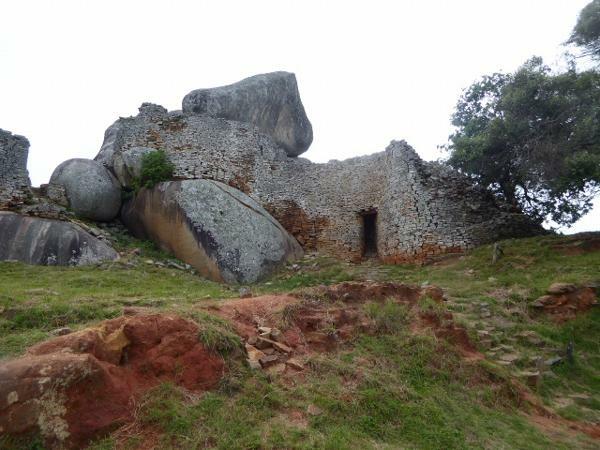 When Cecil Rhodes came by in 1890, for example, the people living nearby were told that the white men were "much interested in the Phallus or Phalli, the Phoenician god...."
João de Barros, whose Da Asia of 1552 discusses Portugal's empire, includes a description of Great Zimbabwe based on what Swahili traders told him. 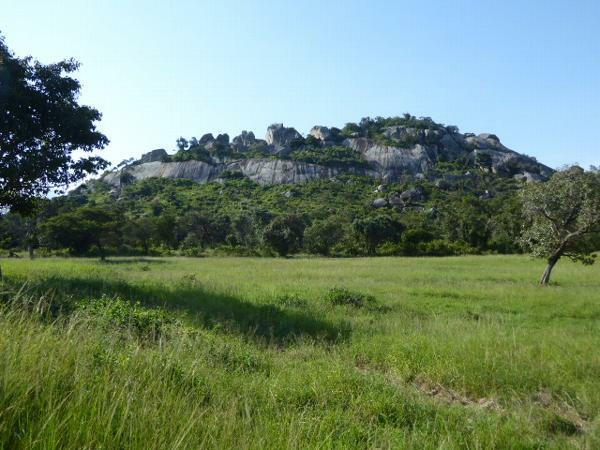 de Barros writes, obviously without having seen the place, of "a square fortress, masonry within and without, built of stones of marvelous size, and there appears to be no mortar joining them...."
In due course John Milton would mention Sofala, now a Mozambican province but once a Swahili trading post. He retains a touch of prudent doubt and writes of "Sofala, thought Ophir" (Paradise Lost 11:400). We'll start up the mountain, here zoomed from the base. The record establishes no foreigner reaching Great Zimbabwe before Karl (or Carl) Mauch, a young German explorer in South Africa. It's 1871, and Mauch has been fired up by a missionary named Merensky, who has told Mauch that the Ophir of Solomon lies in Mashonaland. Mauch sets out to find it. Here's part of the letter Mauch writes to August Petermann back in Germany on September 12, 1871. 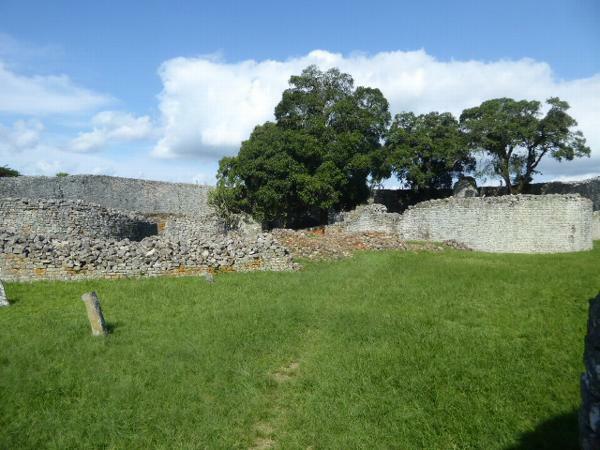 Mauch has just seen Great Zimbabwe for the first time but stays sober. 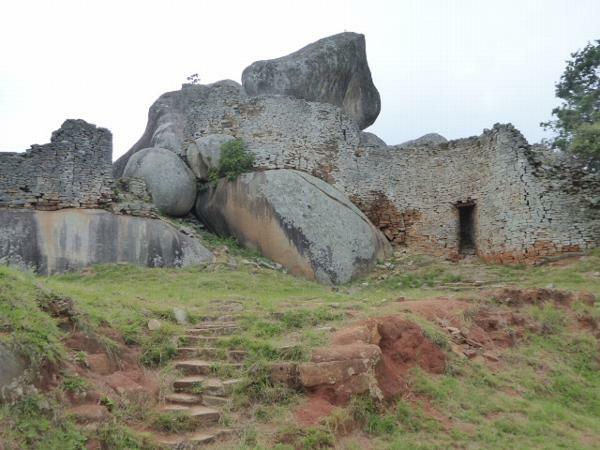 "Zimbaoe, known from Portuguese writings, lies 11 English miles to the east of here and represents a mighty fortress, consisting of two parts of which one, on a hill of about 400 feet with very large boulders is separated by a narrow little valley from the second, which stands on a slight rise. Up till now it has not been possible for me to make a plan of both of them as the walls, in places still 30 feet high, are completely covered, and as dangerous nettles ill repay any attempt to creep through them. 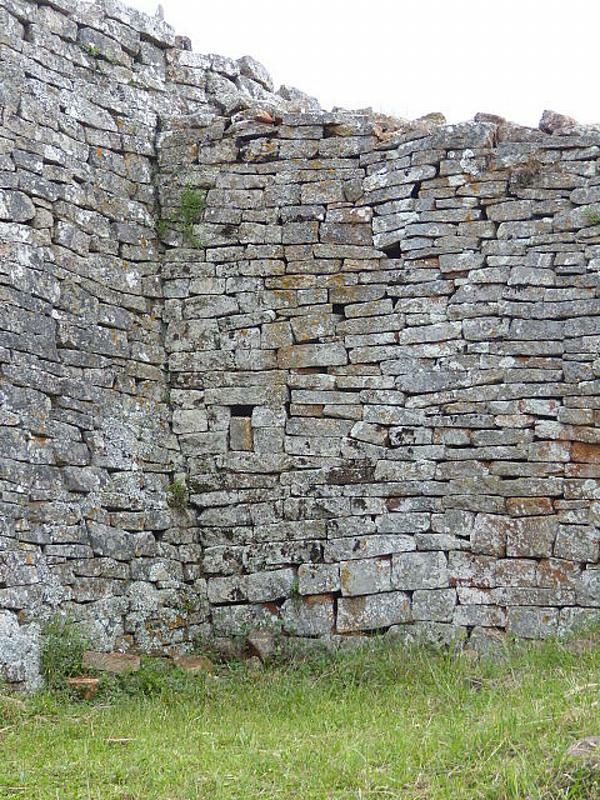 The walls are built, without any mortar, of hewn granite slabs more or less of the size of our bricks, and are, except at three points, very well preserved in a "Rondeau" on the plain of a diameter of about 150 yards. 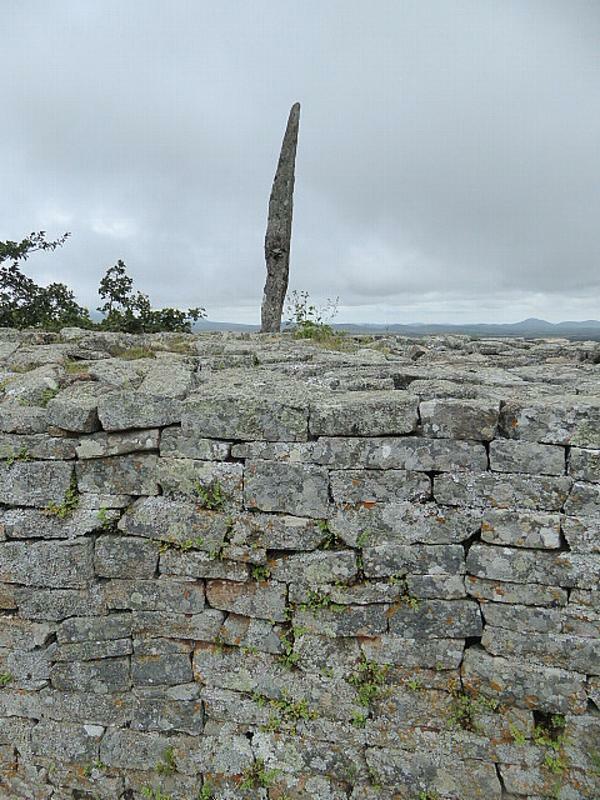 In the southern part of this there stands a tower built up to about 30 feet, at the base of a cylindrical, at the upper half of a conical shape, and in a wall in front of it there are some absolutely black stones which make me suspect that this is a burial site." There's an impressive path up the mountain. 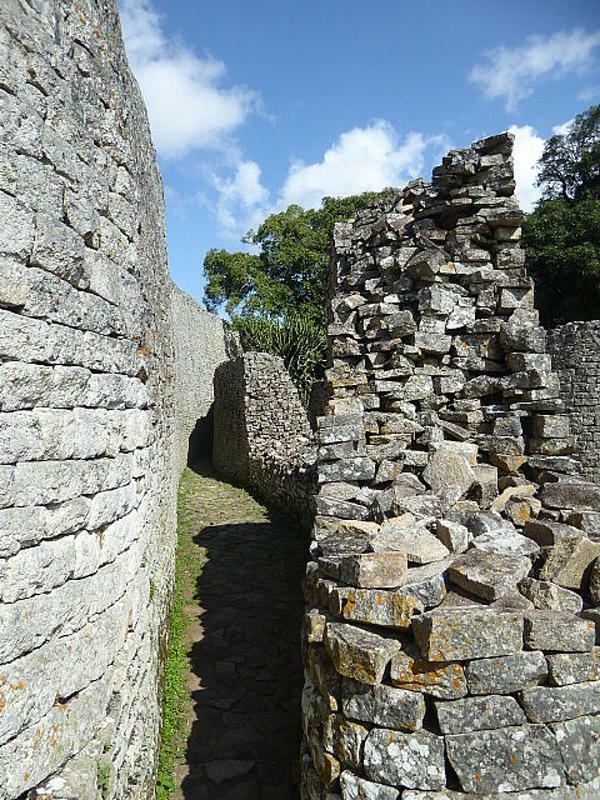 One of the most striking things about these walls--and Great Zimbabwe in general--is a lack of corners. 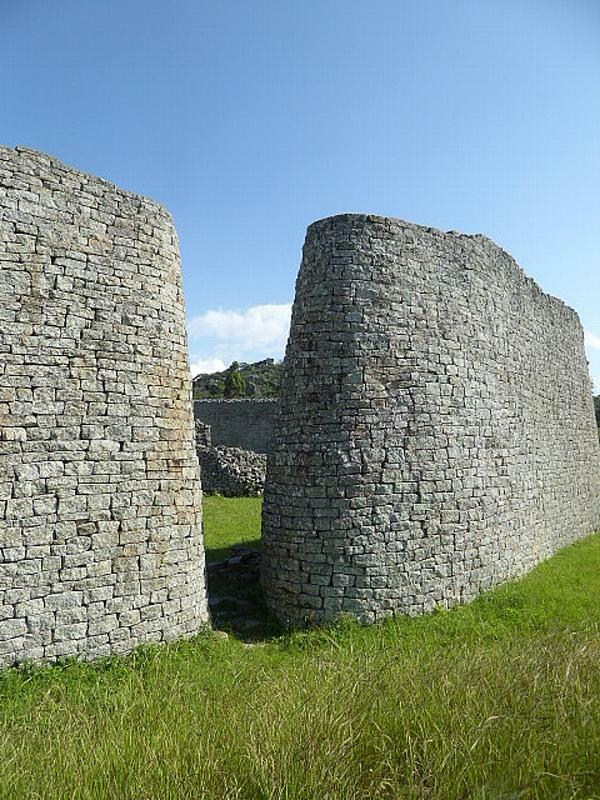 Everything seems to bend except the granite blocks themselves. Mauch spent seven years traipsing around southern Africa, was nearly always broke, and finally went home to Germany sick enough to die at age 37. It's a sad story, especially because his letters home and his journals are full of sound observations. 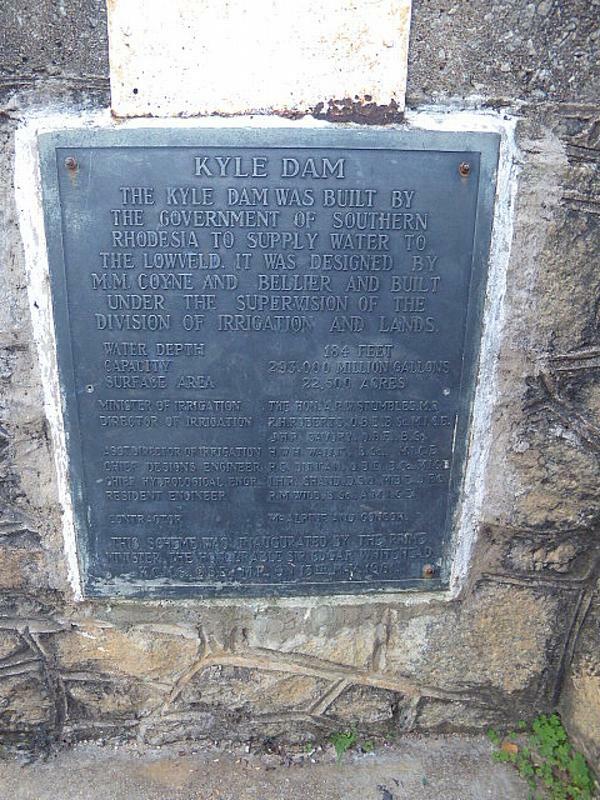 Now, however, there was a physical place on which to hang the Phoenician or Biblical myth, and when Cecil Rhodes visited almost 20 years later, his companion Christiaan de Waal wrote that "...a man who has travelled in that country and sat on the walls of the Simbabe temple cannot fail to be convinced that the Mashonaland gold mines are the same from which King Solomon got his gold (through the Phoenicians)...." de Waal continued: "I am thoroughly convinced that the ruins in and round about Simbabe are a proof to demonstration of the existence in earlier days of thousands, yea tens of thousands, of white men there." Through his British South Africa Company, Rhodes hired Theodore Bent, a student of Phoenicia who had traveled widely in the eastern Mediterranean. The result, in part, was a book by Bent, The Ruined Cities of Mashonaland, 1892. In it, Bent fulminates against the accumulating claptrap: "The names of King Solomon and the Queen of Sheba were on everybody's lips, and have become so distasteful to us that we never expect to hear them again without an involuntary shudder." See anything wrong? Sure you do: the masonry is of a completely different quality. We're looking at a 20th century, alternative route up to the top of the mountain. We're back on the original path. Good thing we're not body builders: we'd never get through. Anyway, Bent found nothing that was not African, and neither has anyone else since. It's been a major disappointment to some visitors. Bent, for one, hoped to find some part of the site "free from kaffir desecration." No luck. (Garlake, 67). Perhaps it's time for a summary of the site's history as understood today. 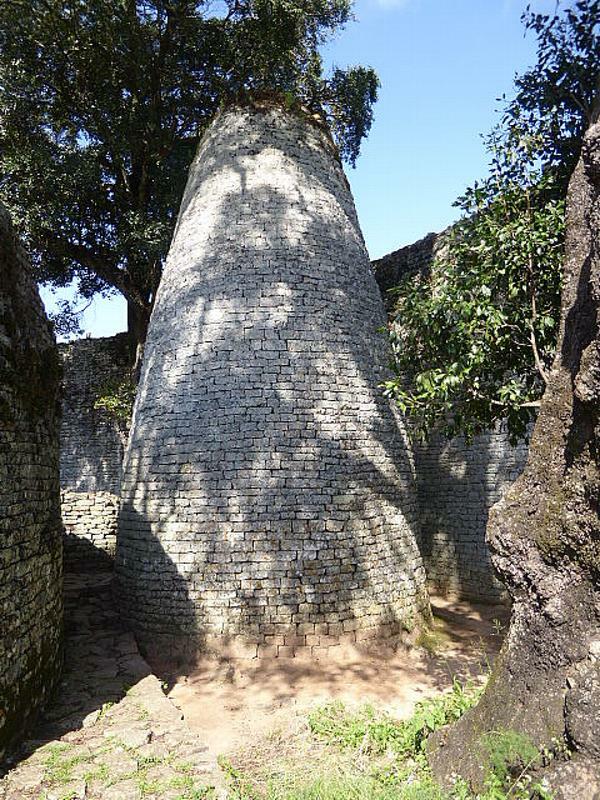 Here's a summary based mostly on Innocent Pikirayi's "Great Zimbabwe in Historical Archaeology," published in Historical Archaeology, 2013, pp. 26-37. 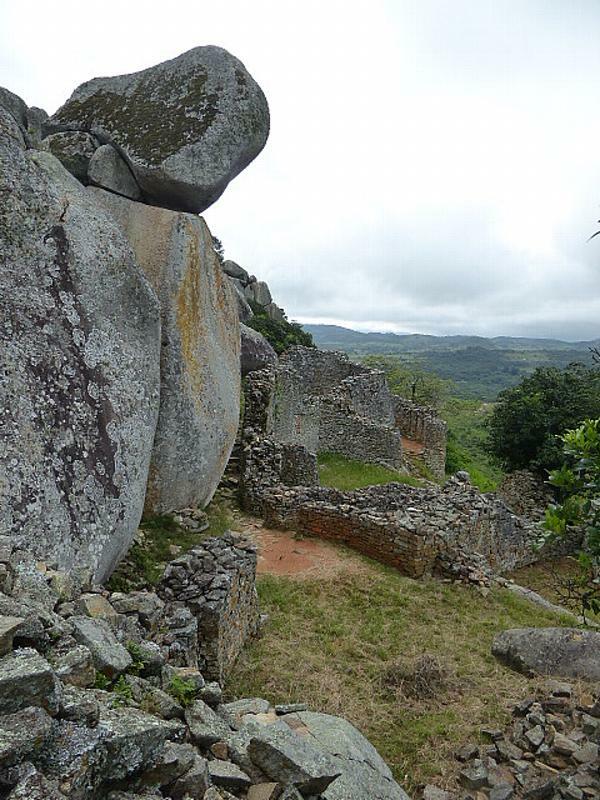 Until the arrival of the British, Pikirayi writes, the Zimbabwe Plateau was controlled by local and regional dynasties, over 300 of which have left ruins on the Plateau today. 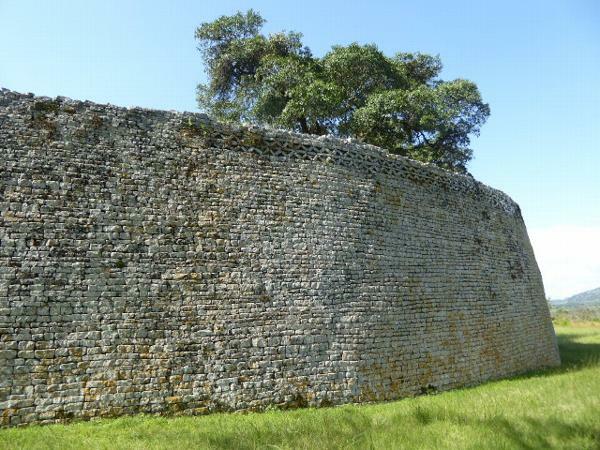 Great Zimbabwe, the greatest of these dynasties, was built by people who had migrated northwards with the decline about the year 1280 of the Mapungubwe State, which was located about 150 miles to the southwest, near the tri-point today of Zimbabwe, Botswana, and South Africa. 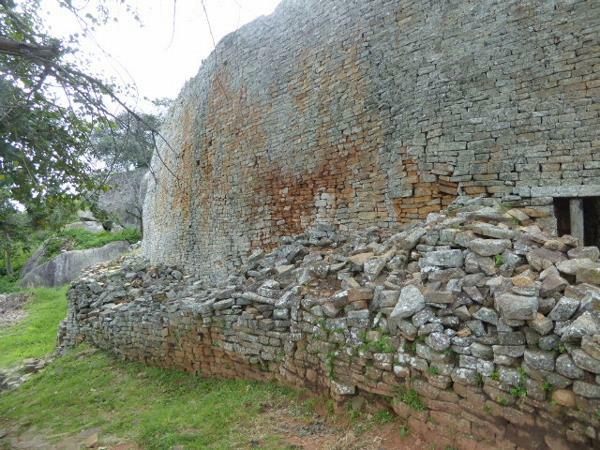 The newcomers brought with them the knowledge of building stone walls, which indeed are found at the site of the Mapungubwe capital, now itself a World Heritage Site and the relic of what seems to have been Southern Africa's first class-based society. 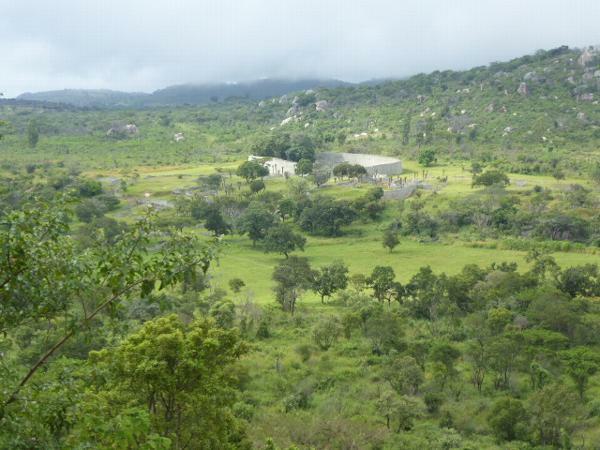 The Magungubwe state had relied on locally mined gold as the essential item in its commerce with the Swahili coast, and as the migrants headed to what would become Great Zimbabwe they "transformed from simple kin-warranted domestic corporations, relying mainly on land and cattle, to long-distance traders. With this newly acquired wealth, they financed the building of stone structures... evidently symbolizing prestige and status. 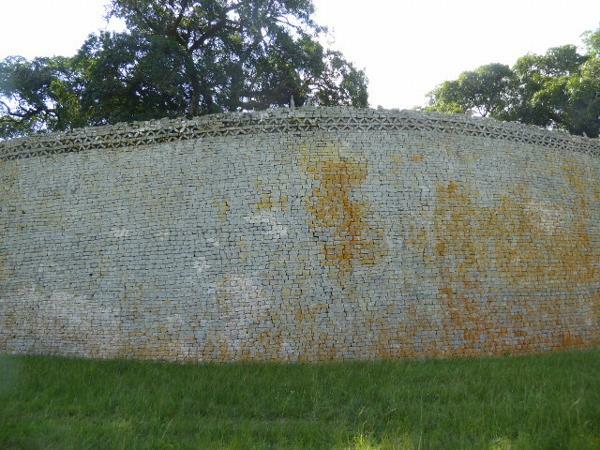 "From about 1300, stone buildings of a scale and magnitude unparalleled on the entire Zimbabwe Plateau were constructed... [and Great Zimbabwe] became the most dominant political authority south of the Zambezi for up to 250 years." 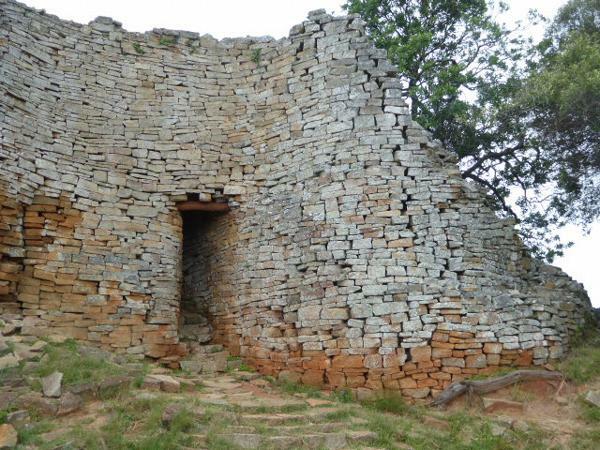 Pikirayi says that the decline of Great Zimbabwe came with the discovery of richer gold mines farther north. 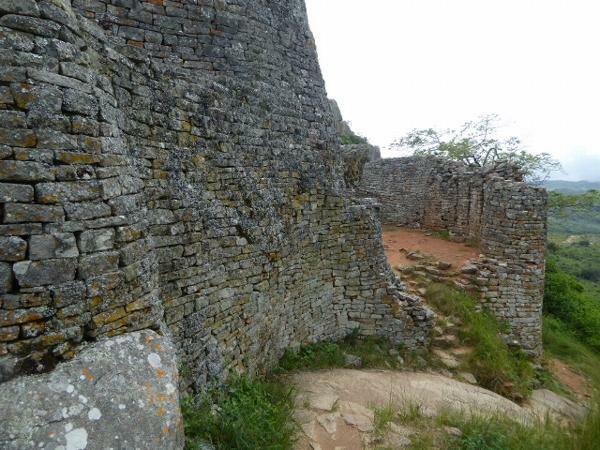 He suggests that the builders of Great Zimbabwe, who had once been a group of about 18,000, never wholly abandoned the site but maintained connections with it that have continued until today, when several groups claim to be descendants of the builders. The relationship of these clans with the colonial and post-colonial custodians of the site has not been an easy one. We've finally made it up to the summit wall, buttressed regrettably by 20th century workers. The doorway is of historically accurate dimensions but judging from the granite lintel probably a reconstruction. Distinguishing new from old can become a challenge. 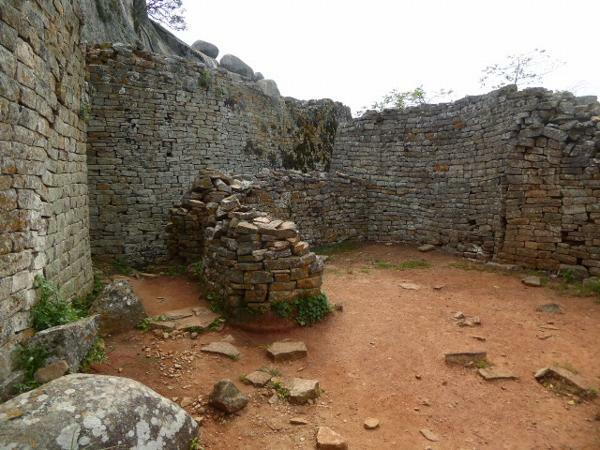 Inside the doorways there's a good example of how walls at Great Zimbabwe were never bonded but instead simply butted into one another. Once through the doorway, things become really messy. It is true that people were living up here when Mauch arrived, but it's also true, as Garlake writes, that "reckless investigators" have dug up the site in wanton pursuit of relics. Among these hunters was Richard Nicklin Hall, a journalist who in 1900, as author of The Ancient Ruins of Rhodesia, was appointed the first Curator of Great Zimbabwe. Garlake can hardly contain his anger in describing Hall's work. Charged with preserving the site, but convinced that it had been built by "ancient Semitic colonizers," Hall removed "at least three to five feet, and in places up to twelve feet, of stratified archaeological deposits. His justification for this, in his grotesquely inapposite words, 'recent and timely preservation work', was that he was only removing 'the filth and decadence of the Kaffir occupation..." (Garlake, pp. 71-4). What is all this earth doing up here? Answer: this is daga, clay mixed with gravel and carried up the mountain to form level floors, sometimes to a depth of 14 feet. 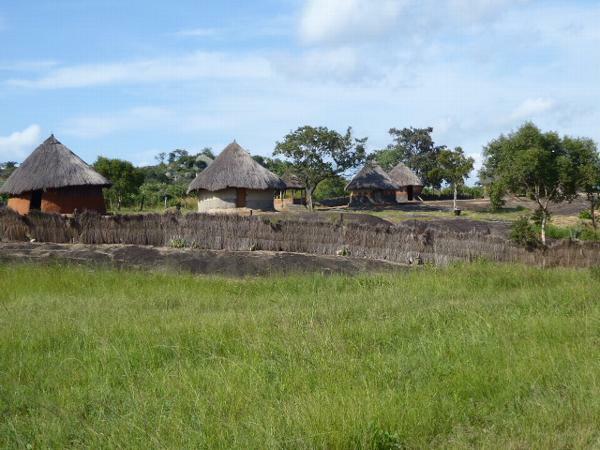 The daga surface has been severely disrupted, but there were apparently 14 dwelling huts in this area. Then there are those walls. Between 1911 and 1948, a British South Africa Company policeman, Corporal St. Claire Wallace, was seconded to the Department of Public Works and appointed Great Zimbabwe's caretaker. 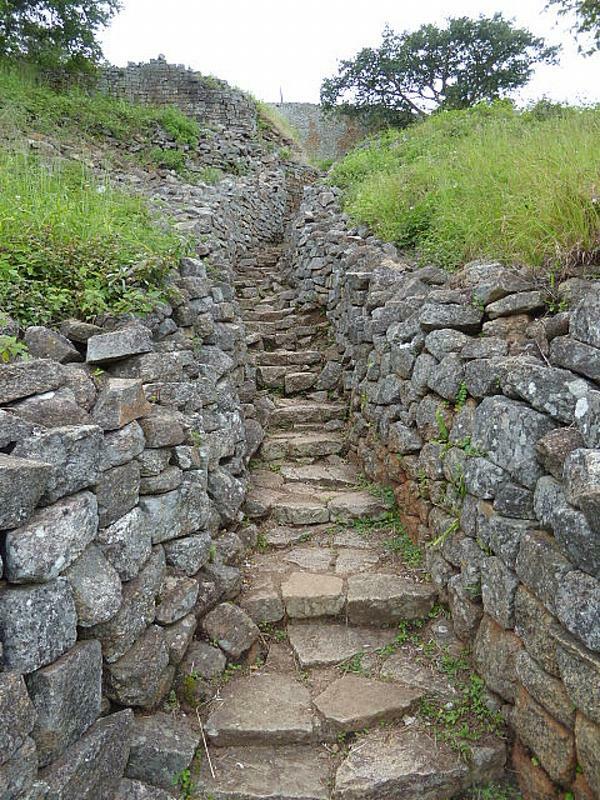 He undertook what Fontein describes (p. 81) as "what turned out to be his life's work--rebuilding huge sections of walling at Great Zimbabwe..." What bits he rebuilt is not obvious, which may do Wallace credit but which also makes understanding the site more difficult. The doorway here makes the wall probably original, because the doorway itself is definitely so. The lintels are slabs of diorite, the hammer-stone rock. We're skirting the top of the mountain. The rooms up here were too irregular to have been roofed. 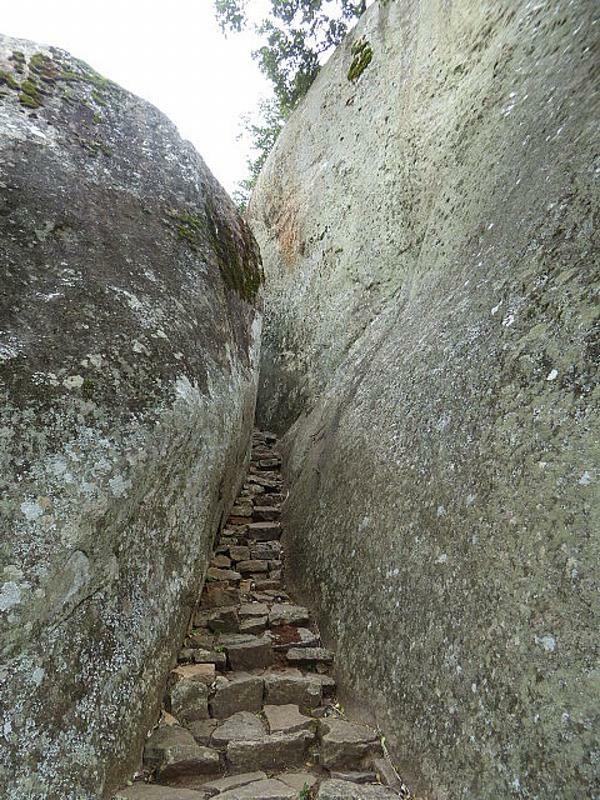 The builders took advantage of exposed rock where they could build on top of it. Some of Corporal Wallace's work? Maybe. Yes, that's a stairway and passage to the left. 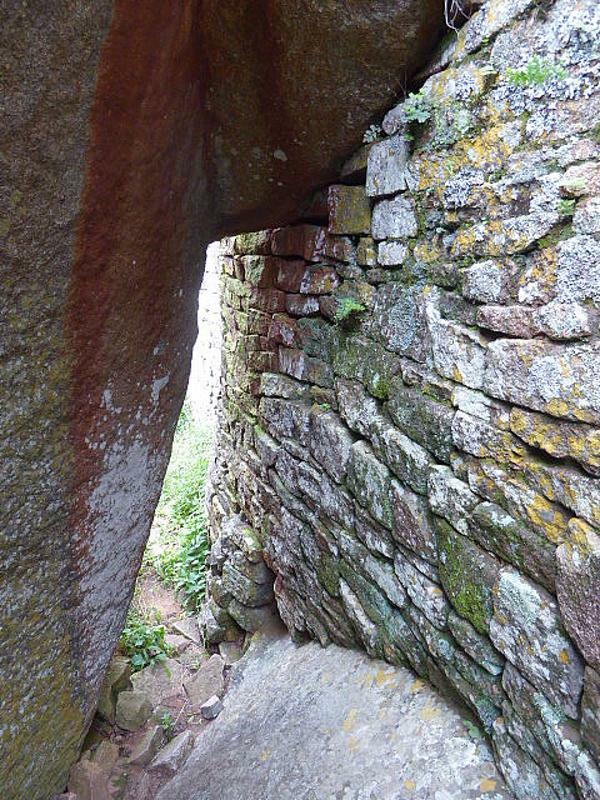 It leads up here, where the surviving walls presumably created enclosed spaces. Footing is a little rough. There are several of these uprights; what they were for is anybody's guess. 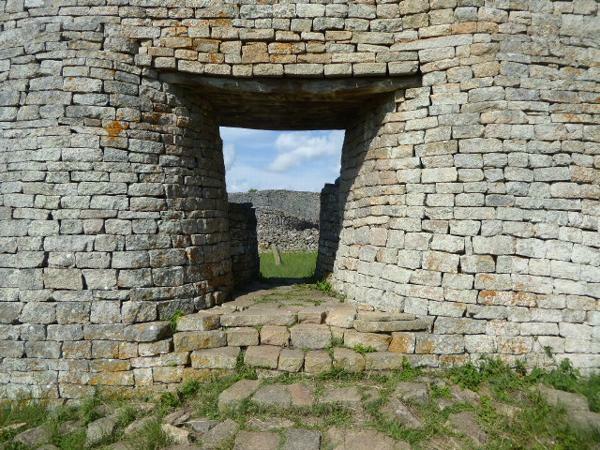 Here's the zoomed view over to the Elliptical Building or Great Enclosure, where we're headed. Since we're up at the top of the mountain, however, we may as well eavesdrop on some interesting conversations. 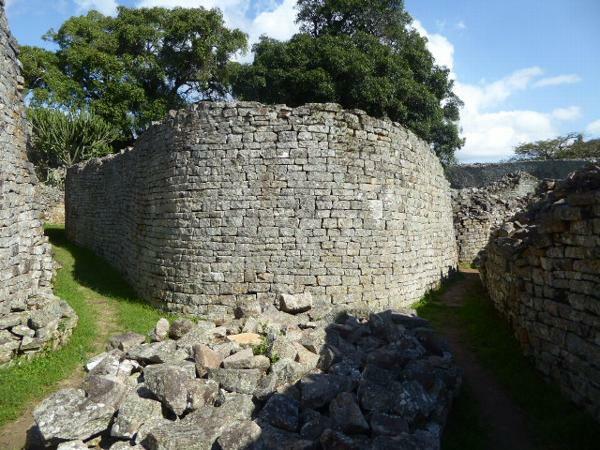 What are your earliest memories of Great Zimbabwe? It used to have a voice. There were the voices of people. They sounded like people talking to each other. Also these voices used to talk to visitors that came there. When did the voices stop? They finished with the coming of the white man. There used to be long back, some other white people that came to trade, Indians and others, but the voices only stopped when the white colonisers came. Nemanwa also told Fontein (p.82): "The new education and wisdom have brought strange ways and learning. The ancestors are not fools. So they said, you have brought your ways and new wisdoms. The new education came, wanting to dig into holy places, searching for the voices of our ancestors which spoke from the caves... All they saw and envied they took away. That brought the anger of our ancestors.... The soil is sick now. The earth cannot smile at us." "After independence," and we're still with Aiden Nemanwa talking to Fontein (p. 164), "people are not yet independent, they are still following the ways of the white people. 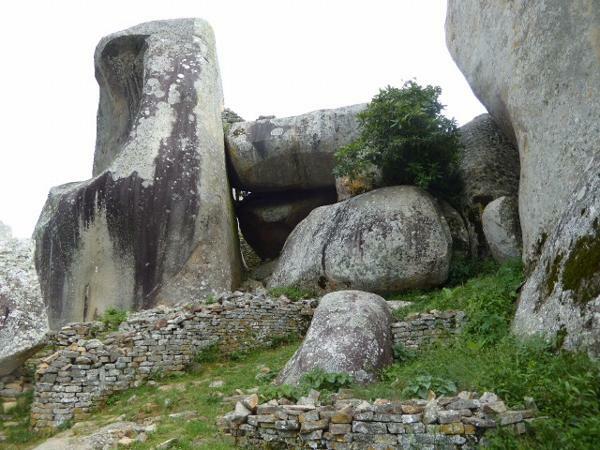 When Great Zimbabwe is again ruled by the traditional custodians, then there will be independence." 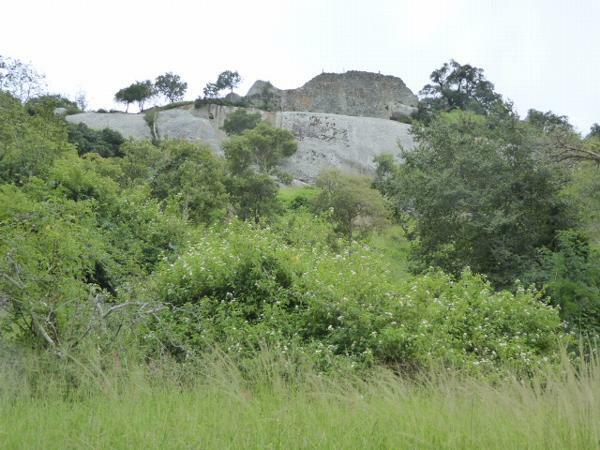 Another informant, Ambuya vaZarira, explained the silence of the spirits this way in conversation with Fontein (p. 103): "It's because they [the site managers both today and in the colonial past] refuse to respect the mountain, to make it important. They have put a wire around the ruins, they have put electricity there. They put a wire fence around the place and a wire to us means you are claiming that as your place." We're walking around the outside of the Great Enclosure, starting on the south side or about six o'clock on an imaginary clockface. Less than two hours of the clock face, so to speak, have chevrons like these. 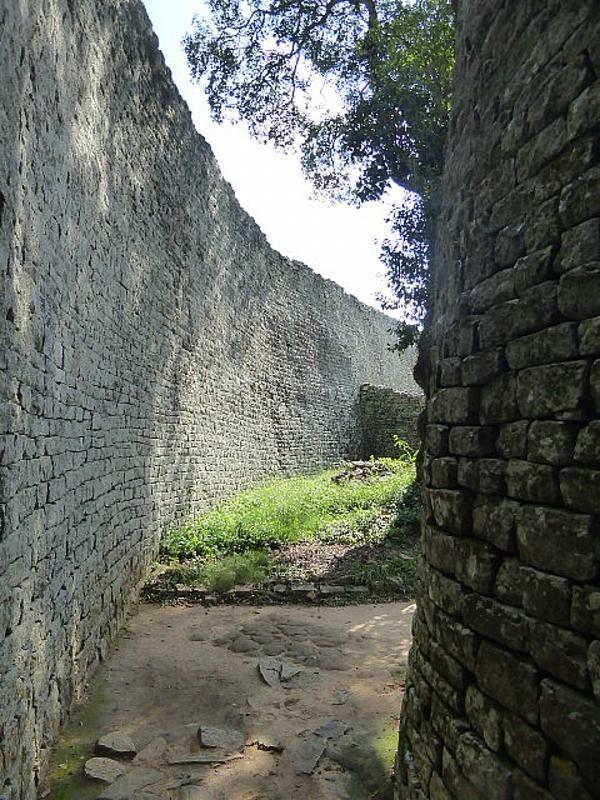 Why the chevrons exist is unknown, but the famous tower is close to the other side of the wall here, near the trees. It's hard, on the ground, not to say "wow" now and then. It's helpful that you can walk around and see nobody else. It's hard to believe that when Mauch came by the thorns were so thick that he couldn't map the site. We've come around to about five o'clock. The total wall length is close to 800 feet. 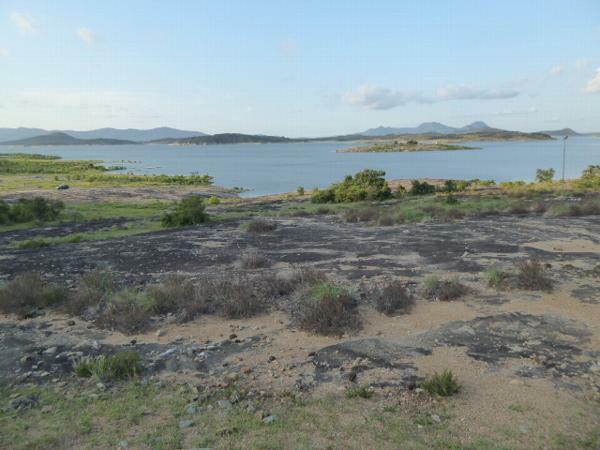 Garlake reminds us (p. 27) that this is "by far the largest single prehistoric structure in sub-Saharan Africa." We've at the northeast entrance or about one o'clock. The chevrons have disappeared, but as with the mountain walls everything here is curved except the blocks themselves. Also, as with the surviving doorway atop the mountain, there's no door here, which implies that the builders weren't building a fortress. We're stepped inside and are looking back along the other side of the wall we just walked along. The trees indicate the location of the tower. Apart from the fragments of collapsed structures, the striking thing is the so-called "parallel passage," the long snaking path whose purpose remains unknown. 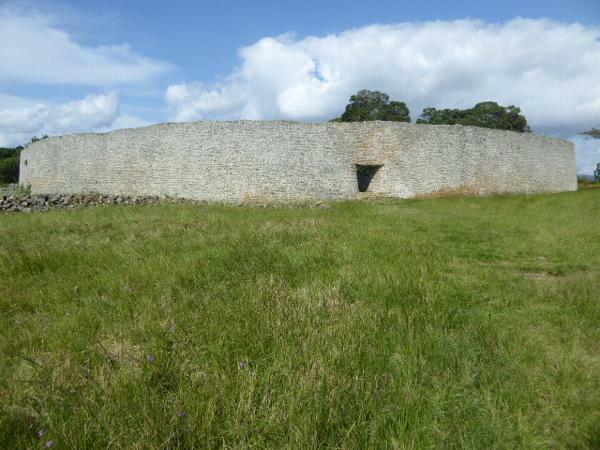 Was the lower wall earlier and simply wrapped at a later date by the higher one? The word "simply" should of course alert you that we're in the realm of speculation. Was it intended as a path of approach to the tower? 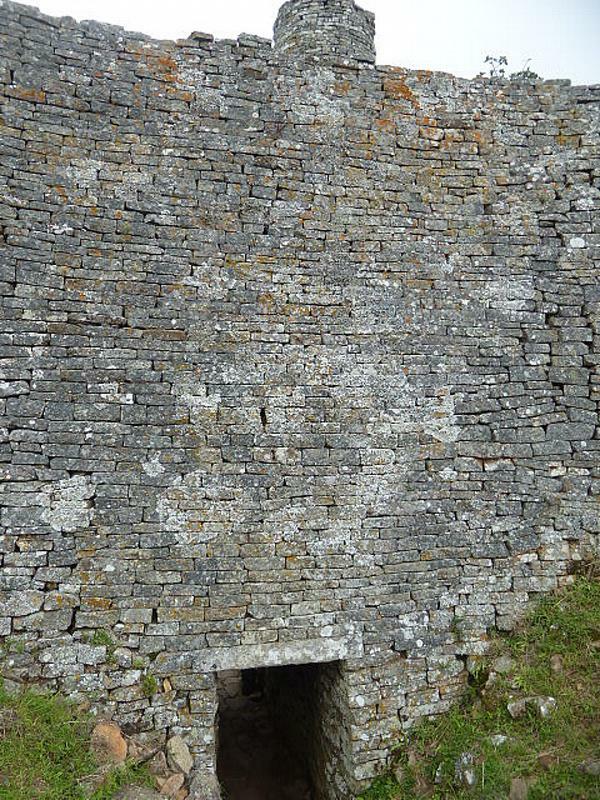 We're walking down the parallel passage; part of the inside wall is broken, revealing the internal structure of the wall, jumbled inside but carefully formed outside. At the end of the passage we come to the tower, seen on the right. The ground here has been disturbed because, as Garlake writes (p. 83), Gertrude Caton-Thompson about 1930 dramatically tunnelled "directly under the Conical Tower from one side to the other. After this, there was still 'not one single item' that [was] not in accordance with the claim of Bantu origin and medieval date." So much for the Queen of Sheba. The tower is 18 feet in diameter and 30 feet high. 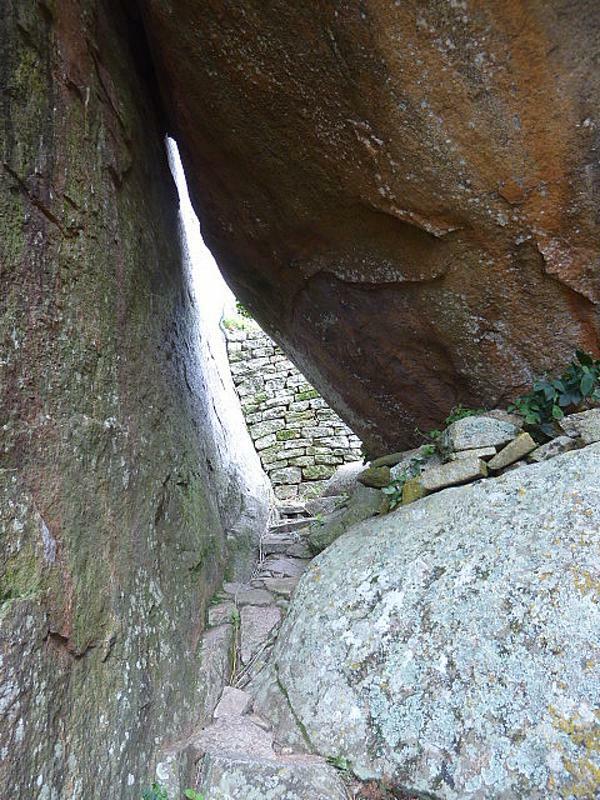 There's no entrance or stairway, nothing inside or on top--or underneath. We're stepped back a bit. Think these foreground walls are original or the work of a 20th century curator? 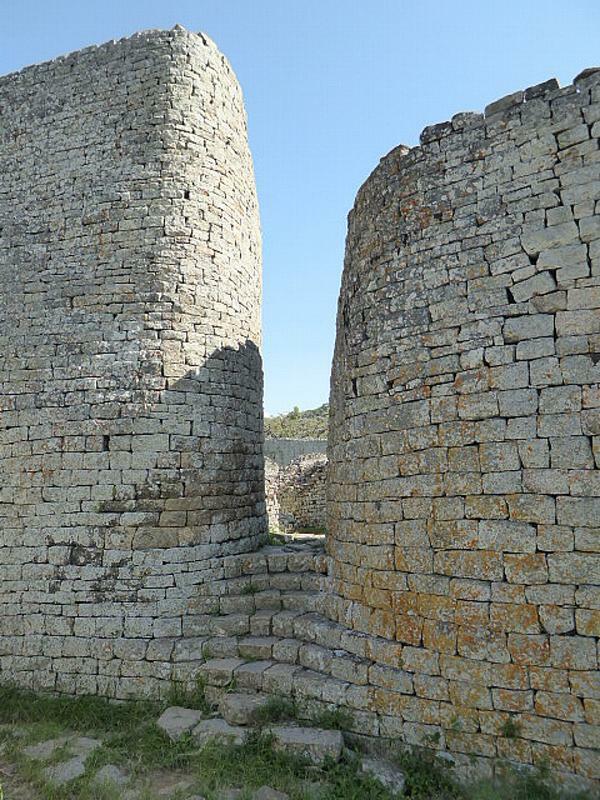 There are perhaps a dozen enclosures within the outer wall, but most are now fragmentary. The north entrance at 11 o'clock lacks the elegant stairs of the last entrance we saw. Here's the west entrance at 9 o'clock. 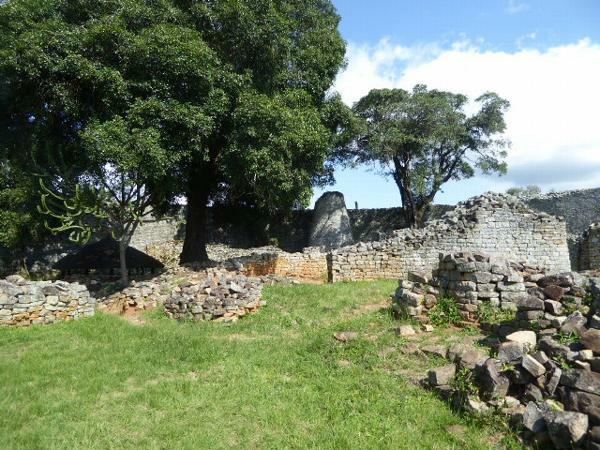 It's been rebuilt twice in the 20th century, first in 1912 by St. Claire Wallace, the ex-policeman, then again in 1995 by the NMMZ (National Museums and Monuments of Zimbabwe) because it seemed about to collapse. It's impressive if it's the first entrance you see; if you see it again after seeing the others, it looks crushingly heavy. 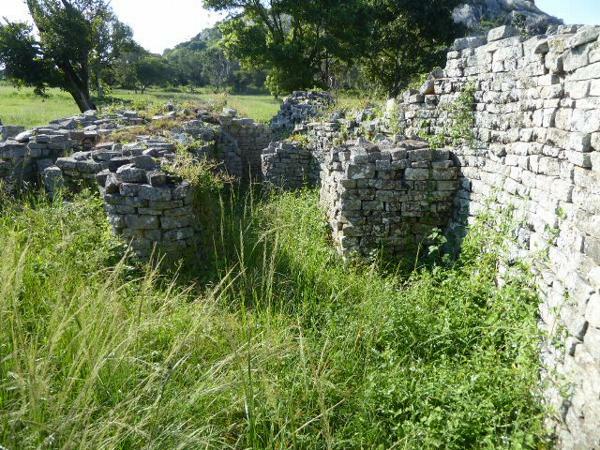 There are lots of ruined buildings outside the Great Enclosure. Modern or original? The existence of corners hints at recent restoration. Think a Shona village survives on the site? 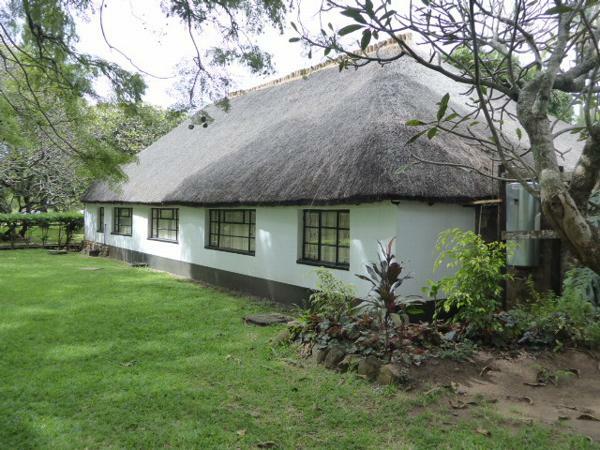 These huts, with traditional crafts on display, were the idea of Lillian Hodges, director of the National Museums of Southern Rhodesia from 1959 to 1973. J. Desmond Clark says in a video interview with Timothy Troy that Hodges was a skilled amateur archaeologist who had worked with her husband. He had died suddenly, possibly poisoned by a disgruntled servant. She succeeded him as director of the National Museums but eventually retired to running a bookshop in Masvingo. Clark recalled that until her death she lived there alone with a huge dog. 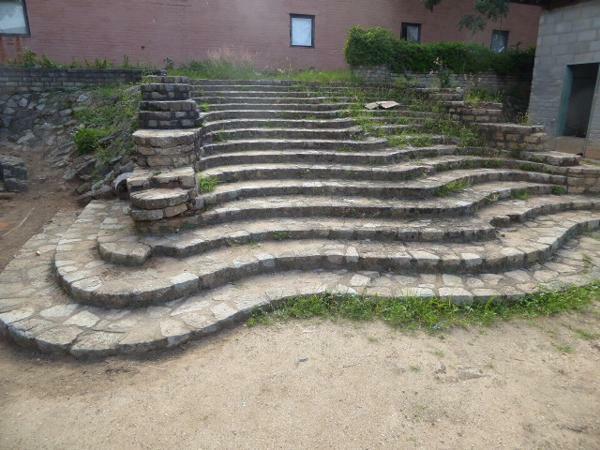 The "village" was originally located between the mountain and the Great Enclosure but was burned during the civil war. It was rebuilt on a new site in 1988 but closed in 1997 and reopened in 2002. The idea was to have potters and smiths and healers and musicians demonstrate their skills, but there are very few visitors and the "villagers" are actually employees of the museum, and could be--and have been--dismissed, as was a sculptor, Simon Nyanda, whose work apparently offended visitors. Fontein writes (p. 203) that "all the village performers and occupants are required to sign a contract with NMMZ, which enforces a strict code of conduct, allows only very limited leave, and only one day of notice in event of discharge." 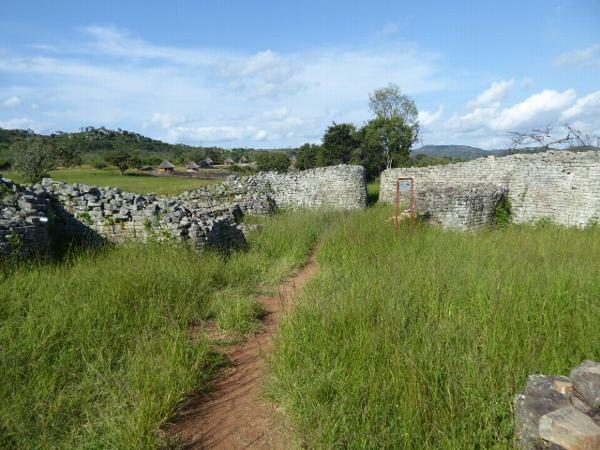 Fontein, whose sympathies clearly lie with the villagers living in the vicinity, writes (p. 181) that the policy underlying management of Great Zimbabwe is "driven more by financial concerns and the needs of international heritage organisations than by the concerns of local communities." 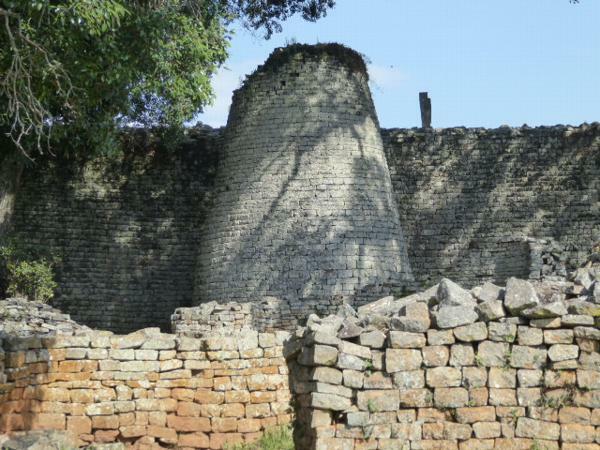 The Great Zimbabwe Hotel soldiers on through the decades. So for a while did Sheppard's, now demolished but leaving behind this Great Zimbabwean staircase. Sheppard came from the English town of Grimsby, joined the South African Police in 1904, then came to Fort Victoria (Masvingo) to work in the Victoria Hotel. Early in the 1930s Sheppard built his own hotel near the ruins and on a site appropriately still called Sheppard's Plot. He died in 1952 of blackwater fever, a virulent malaria. 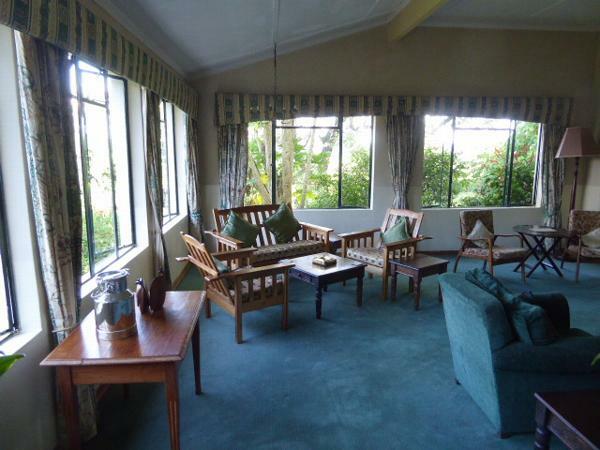 The hotel site adjoins a newer property, the Lodge at the Ancient City, whose bungalows mimic a Shona village. Here's a much bigger relic of colonial rule. 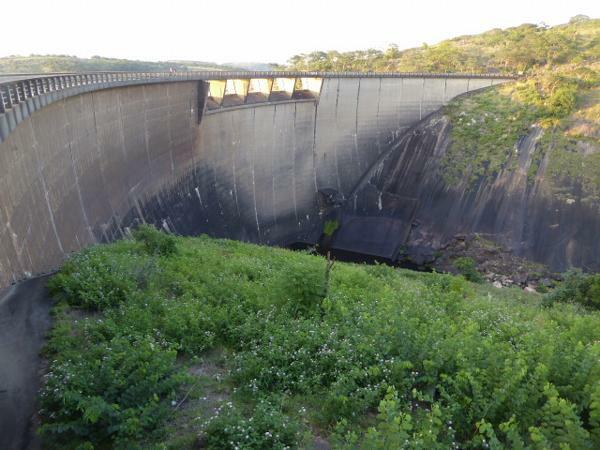 It's the Kyle Dam, completed in 1961 and about five miles east of Great Zimbabwe. The dam irrigates sugarcane grown on an industrial scale about 60 miles downstream, around the town of Triangle. 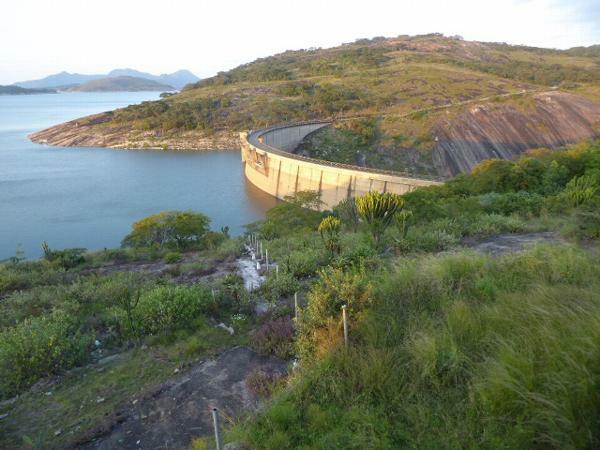 The downstream face of the dam. The reservoir required the relocation of villagers. 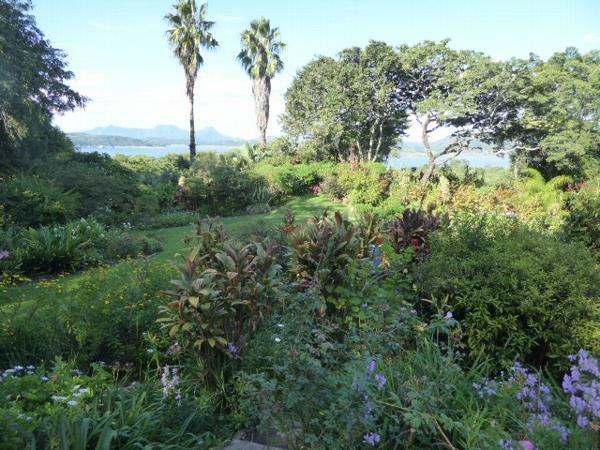 Up above the reservoir, there's a handsome garden attached to the retirement home built by Murray McDougall, the sugarcane pioneer. He called it Dunollie, evocative of his Scottish background. In recent years it's operated as Norma Jean's Lakeview Resort. A few miles away, down by the lake, there's a reminder of the musical chairs that have been played here longer than anyone remembers. 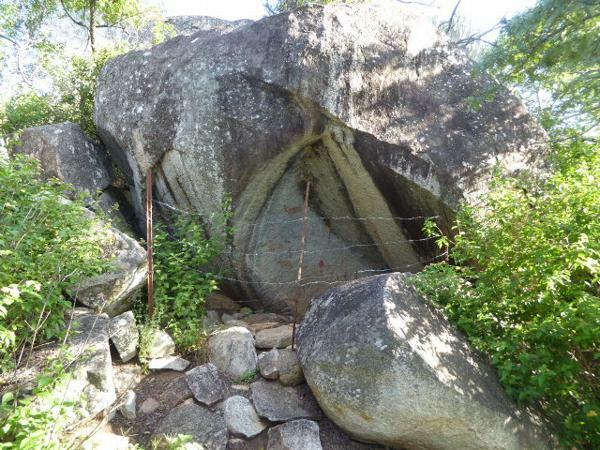 Poke around these boulders. Crows will object and caw as they leave. 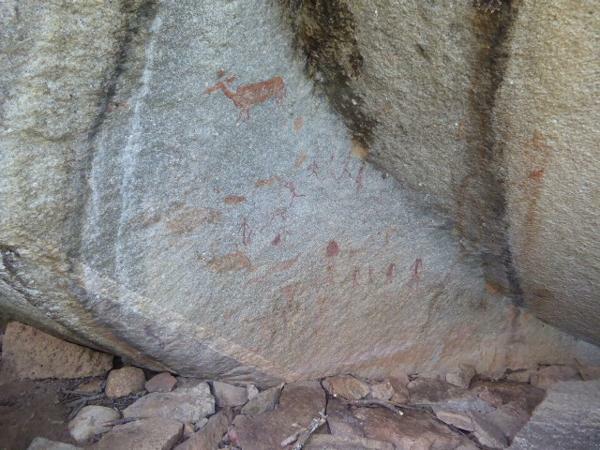 Semi-protected by T-bar and barbed wire, there are paintings on the rock. They're the work of bushmen and show hunters at the chase. 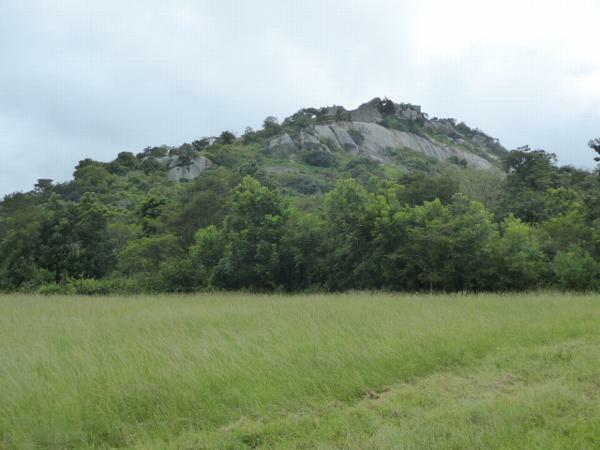 Makes you wonder what the Bushmen thought of this mountain, which they knew long before the days of Great Zimbabwe.